"Mario Kart: Super Circuit, known in Japan as Mario Kart Advance (マリオカートアドバンス, Mario Kāto Adobansu), is a racing game developed and published by Nintendo for the Game Boy Advance in 2001. It was the first Mario Kart released on a handheld game system; in 2005, a second handheld Mario Kart game titled Mario Kart DS was released. It is the first Mario Kart game not to be developed by Nintendo EAD; instead, it was developed by Nintendo's Intelligent Systems division. 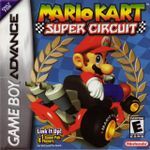 Super Circuit combines features from earlier Mario Kart games (Super Mario Kart and Mario Kart 64). In particular, it features the gameplay mechanics of the latter title and tracks from the former game. In the game, eight racers take to the tracks and race for first place." Source: Wikipedia, "Mario_Kart:_Super_Circuit," available under the CC-BY-SA License.